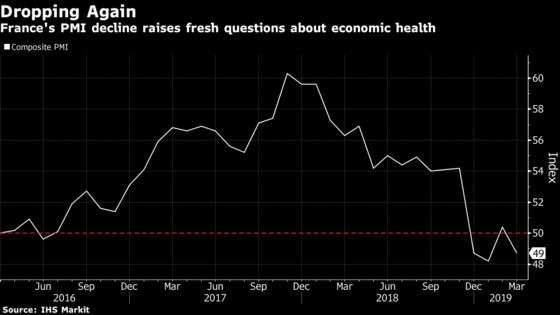 France’s economic woes resurfaced at the end of the first quarter as business activity unexpectedly resumed a decline. IHS Markit’s measure of manufacturing and services dropped to 48.7 this month, falling once again below the 50 level that separates expansion from contraction. The figure was less than February’s reading of 50.4 and defied economists’ predictions for a small improvement. The euro erased gains to trade little changed at $1.1374 as of 9:17 a.m. in Paris. Demand for new orders fell and work from abroad fell at the fastest pace for nearly three years, with some survey respondents blaming disruption from the by the Yellow Vests protesters and the postponement of Algerian elections. Firms also became less confident in the outlook for business, Markit said. Earlier this month, the European Central Bank reacted to a softer outlook by delivering a fresh round of monetary stimulus in the forms of new loans for banks and slashing its growth forecast for 2019. Markit is due to release its readings for the German and euro-area economies later Friday.